Pies. Galettes. Buckles. So many ideas, and yet the sad reality is that sometimes I don’t have the time to make the 15 beautiful, latticed apple pies that I lust after on Instagram. This simple green apple tart with apricot jam is a savior in that regard - it’s beautiful, it’s rustic, it’s quick, and most of all, it’s so simple that I feel like I can whip up an apple dessert anytime, any day. Flaky, rich, tender, sweet, and just a bit tart - that’s how I like my apple tarts. 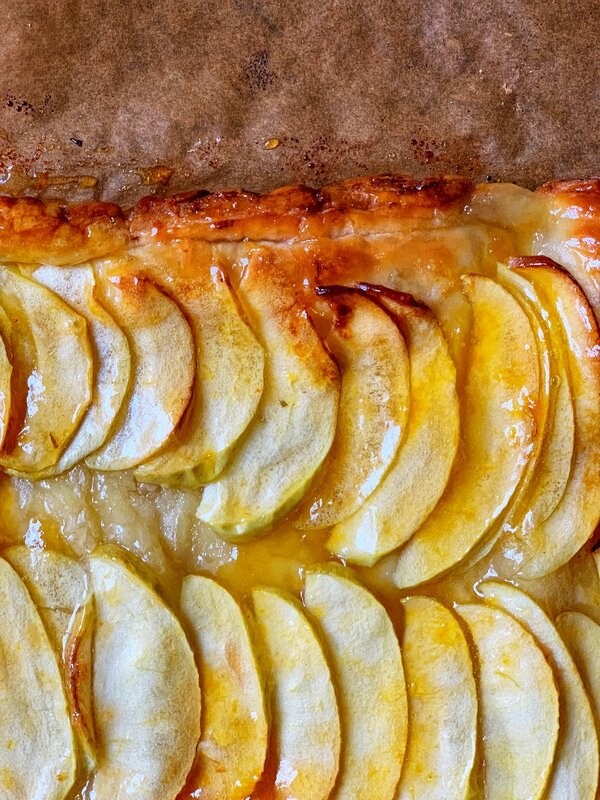 I used store-bought puff pastry for this recipe because I wanted a simple and quick go-to apple dessert that I could make on a moment’s whim. If you would like, you can sub-in homemade puff pastry. Green apples pair beautifully with the buttery puff pastry crust and the sweet apricot jam. If you want to add some glamour, dust on some powdered sugar and sliced almonds - it’ll be the hit of the party, and no one will know just how easy this was. Preheat the oven to 400 degrees Fahrenheit. Open the thawed puff pastry sheet and remove the paper. On a large piece of parchment (that fits inside of a baking sheet), roll out your puff pastry to an 8 by 12-inch rectangle. Place the parchment, with the rolled out puff pastry, onto your baking sheet. Prepare your apples: Peel, core, and slice the apples 1/4-inch thick crosswise. Cube your butter into small pieces. Arrange the apple slices onto the puff pastry in an overlapping pattern. Leave a 3/4-inch to 1/2-inch border around the pastry. Sprinkle all of the 1/4 cup of sugar onto the the apples, and dot the apples with bits of the cubed butter. Transfer the apple tart to the oven, and bake until the pastry is golden and the apples are tender (about 25-30 minutes). Remove the tart from the oven - it will puff up a bit, but will eventually settle down. You can gently prick with a fork to help along the process. While the tart is settling down, mix 1/4 cup of apricot jam and 1 tablespoon of brandy (rum or water) in a small bowl. Heat in the microwave for about 30 seconds - just until the jam is loose. Brush the warm tart completely with the jam mixture. Cut into pieces with a sharp knife. Serve warm or at room temperature (best enjoyed the same day).